Although sawfish look similar to sharks, they are actually highly modified rays. The ‘teeth’ on the rostrum, snout, are actually enlarged specialize denticles. The knifetooth sawfish differs from other sawfish species as it lacks rostral teeth at the base of the rostrum. English: narrow sawfish, pointed sawfish, and pointed saw-fish (Eschmeyer, et al., 2016). Most landings are accidental bycatch in various fisheries. Occasionally the species is targeted by fishermen using nets, hook and line, and even harpoons. When captured by Australian shrimp trawlers, their rostra are often removed and sold. Like all sawfish their fins are sold into the Asian ‘shark fin’ market, their livers are processed for oil, and skins are made into leather. The rostra are often sold as traditional medicine, religious offerings, and curios (Compagno, et al., 2005; Lack and Sant, 2008; Lack and Sant, 2009; Guilford, 2014). All sawfishes are harmless to humans if left undisturbed. Humans are too large to be viewed as potential prey. Though care must be taken when handling or approaching a sawfish of any size, as they may defend themselves, with their ‘saws’ which can inflict substantial damage. Even though knifetooth sawfish are listed as “Endangered” by the IUCN, effective legislation is still lacking to properly protect them. All sawfish products are globally banned by the Convention on International Trade in Endangered Species of Wild Fauna and Flora (CITES). Western Australia and Queensland have certain protections in place, but the knifetooth has the lowest survival rate after capture and handling of any sawfish, making any interaction a risk (Salini et al. 2007). While still common, preliminary data indicates that adults measure only two-thirds the former maximum size in Australia. Human-induced habitat loss and pollution has added to population decline as well. > Check the status of the knifetooth sawfish at the IUCN website. A. cuspidata occurs only in the Indo-Pacific. It ranges from the Red Sea through the South China Sea to the Yellow Sea, southwestern Japan, the western Philippine Sea, Arafura Sea, and the Gulf of Carpentaria. In Australia the species is found from Cape Talbot (Timor Sea) to the northern extent of the Great Barrier Reef (northern Coral Sea). The complete distribution of A. cuspidata remains unclear (Last et al., 2016). Primarily a benthic species, preferring sand, mud, and seagrass. A. cuspidata is found in estuaries, bays, and river mouths. It has a depth range from the shallows to 40 m (131 ft.) (Last and Stevens, 2009). Individuals have been recorded far upstream in rivers, including the Tachin river in Thailand. Though these accounts may be the result of confusion with other sawfish species. Estuaries are critical habitat for the juveniles (Peverell, 2005). All sawfishes are highly modified elongated rays. Sawfish are able to breathe while lying on the seafloor by drawing water into their gills through large holes behind each eye, called spiracles. Their most distinctive feature is their long flat rostral “saw” – studded with rostral teeth along the margins. These “teeth” are set deeply in hard cartilage and do not grow back if the root becomes damaged. Knifetooth sawfish are easily distinguished from other sawfish species by slender saw, containing 18-24 dorso-laterally flattened and broadened rostral teeth per side and the absence of rostral teeth at the base (Last, et al., 2016). In northern Australian waters, the teeth vary between 18 and 22 per side. 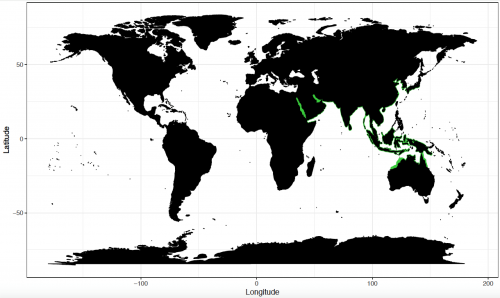 Though populations in the Indo-Pacific can have more (24-25 per side). Rostral teeth may number more on one side. All sawfish can be distinguished from sawsharks (Pristiophorus spp.) by their lack of barbels, dorso-laterally compressed body, ventrally located gills, similarly-sized rostral teeth, large size, and preference for shallow coastal habitats. Knifetooth sawfish can be easily distinguished from other sawfish by its size and rostral teeth count and orientation (See table) (Last et al., 2016). The dorsal body surface is gray, fading to a lighter gray ventrally. Its rostral teeth are white, contrasting strongly with their gray rostrum which turns to a dark brown at its base. The fins are a pale gray, often lighter in color than that of the dorsal body surface (Last et al., 2016). Multiple rows of blunt teeth with rounded cusps and smooth surfaces, in both jaws. Body and fin denticles are very small and have a flat crown with three posterior cusps. The denticles along the rostrum and edges of fins are similar in shape and arrangement, although fin denticles are slightly larger. Denticles of adults are widely spaced except where concentrated along the anterior edges of the head and fins (Deynat, 2005), while fetal specimens and young up to 64.2 cm (25.3 in.) are devoid of denticles. In a specimen measuring 71 cm (28 in. ), denticles were present only on the anterior portion of the rostrum and along the anterior edge of all fins. In Australia, A. cuspidata can grow to 3.5 m (11.5 ft.) (Last et al., 2016). Unconfirmed reports suggest larger sizes elsewhere, such as 6.0 m (19.7 ft.) in India and 8.0 m (26.2 ft) in Thailand. However these rumors seem doubtful. A. cuspidata typically reaches maturity at 2-3 years of age, males measuring 200 cm (6.5 ft.), while females reach 230 cm (7.5 ft.) (Peverell 2005). A. cuspidata are believed to have a litter of about 12 pups per year (Peverell, 2005; D’Anastasi, 2010). The unique rostra of sawfish allow them to search and capture prey. The rostrum is covered with sensory organs called “ampullae of Lorenzini”, electroreceptors that detect electrical signals emitted from prey. Once detected, the sawfish will swing its saw from side to side in order to dislodge invertebrates from substrate and to stun schooling fishes. Known food items of this species include squids and small fishes, though crustaceans are likely as well (Last et al., 2016). Like all rays, A. cuspidata utilizes aplacental yolk sac viviparity. Embryos are nourished by their yolk sac in utero, being fully absorbed before the young sawfish are born (Stevens et al., 2005). The gestation period of A. cuspidata is not known, but the largetooth sawfish (Pristis pristis) has a gestation period of about five months. A. cuspidata pup likely in the spring with litter sizes range from 6 to 23 young, each measuring between 0.5-0.8 m (1.5 and 2.5 ft.). The saw teeth of young sawfish are covered in a sheath of tissue until after birth so as not to injure the mother (Walker, 2003; FSUCML. 2016). Young sawfish rostral teeth develop soon after birth. The reproductive cycle of the knifetooth is still undocumented, but the largetooth sawfish has been reported to produce litters every other year. 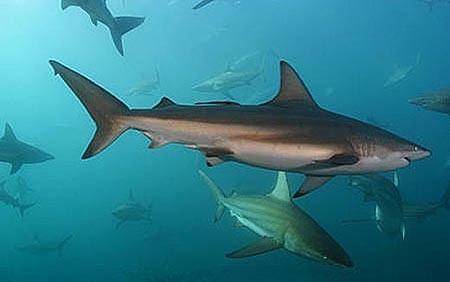 Sharks, including hammerhead sharks (Sphyrna sp.). 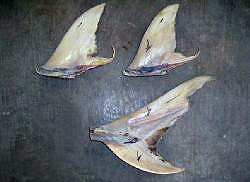 Other likely predators of the knifetooth sawfish include bull sharks (Carcharhinus leucas), copper sharks (Carcharhinus brachyurus), and saltwater crocodiles (Crocodylus porosus). When entangled in a net, this species becomes particularly vulnerable to predation. The parasites Nonacotyle pristis and Neoheterocotyle darwinensis n. sp. inhabit the gills of other sawfishes off Darwin, Australia and in Papua New Guinea. These parasite species may also use the knifetooth sawfish as a host. This species was first described as Pristis cuspidatus in 1794 by John Latham in his article entitled “An essay on the various species of sawfish” in the journal Transactions of the Linnaean Society of London. Latham described the species based on two rostra. Unfortunately, these rostra were not saved. A single rostrum was however, illustrated in the article. It took nearly a century before a specimen was designated as a representative of the species, it is now cataloged at the Muséum National D’Histoire Naturelle in France. Three other synonyms exist for the knifetooth sawfish, Anoxypristis cuspidatus Latham 1794 (a misspelling and gender mismatch), Oxypristis cuspidatus (Latham, 1794), and Squalus semisagittatus Shaw 1804 (the last two being junior synonyms). In 1913, the author Hoffman renamed the genus for this species from Pristis to Oxypristis, noting differences in various morphological characters, including the rostral cartilage and neurocranial structures, and the positioning and shape of various fins. However, the genus name Oxypristis Hoffman, 1913 was preoccupied by the insect genus Oxypristis Signoret, 1861. To avoid homonym problems, workers by the names of White and Moy-Thomas simply added a prefix to create Anoxypristis in 1941. To date, the name for this species has changed only slightly, being currently valid as A noxypristis cuspidata (Latham, 1794). The generic name Anoxypristis means “sharp saw” in Greek and can be broken down to the terms oxy, meaning “sharp”, and pristis, meaning “saw”. The prefix an should probably not be referred to in a translation of the genus, as this later addition was added simply to avoid homonym problems. The specific name cuspidata is derived from the Latin word cuspidatus, meaning “pointed”. Together, the scientific name Anoxypristis cuspidata refers to the sharp-sided, blade-like rostral teeth of the animal. Compagno, L.J.V., Cook, S.F. and Oetinger, M.I. 2005. Knifetooth, pointed, or narrow sawfish Anoxypristis cuspidata (Latham, 1794). In: S.L. Fowler, M. Camhi, G.H. Burgess, G.M. Cailliet, S.V. Fordham, R.D. Cavanagh, C.A. Simpfendorfer, and J.A. Musick (eds) Sharks, rays and chimaeras: the status of the chondrichthyan fishes. IUCN SSC Shark Specialist Group. IUCN, Gland, Switzerland and Cambridge, UK. D’Anastasi, B.R. 2010. Conservation genetics of the critically endangered narrow sawfish (Anoxypristis cuspidata) in northern Australia. James Cook University. Eschmeyer, W.N., Fricke, R. and Van der Laan, R. (eds). 2016. Catalog of Fishes: genera, species, references. Updated 29 September 2016. Guilford, Gwynn. 2014. Fishing, Chinese Medicine, and a Crazy-Looking Snout Are Driving Sawfish to Extinction. Quartz, qz.com/217333/fishing-chinese-medicine-and-a-crazy-looking-snout-are-driving-sawfish-to-extinction/. Lack, M. and Sant, G. 2008. Illegal, unreported and unregulated shark catch: A review of current knowledge and action. Department of the Environment, Water, Heritage and the Arts and TRAFFIC, Canberra. Lack, M. and Sant, G. 2009. Trends in Global Shark Catch and Recent Developments in Management. TRAFFIC International, Cambridge, UK. Last, P., Naylor, G., Séret, B., White, W., de Carvalho, M. and Stehmann, M. eds. 2016. Rays of the World. Csiro Publishing. Peverell, S.C. 2005. Distribution of sawfishes (Pristidae) in the Queensland Gulf of Carpentaria, Australia, with notes on sawfish ecology. Environmental Biology of Fishes 73: 391-402.